The fashion company reported a decline in sales and earnings, but analysts expected much worse. What: Shares of fashion company Fossil Group (NASDAQ:FOSL) soared on Wednesday following the company's fourth-quarter earnings report. Expectations were low, and the company managed to handily beat analyst estimates for both revenue and earnings. At 11:30 a.m. EST Wednesday, the stock was up about 26%. So what: Fossil reported quarterly revenue of $992.5 million, down 6.8% year over year, but nearly $70 million higher than the average analyst estimate. Currency had a major negative impact on Fossil's performance, reducing sales by $55.6 million and EPS by $0.28. Adjusted for currency, fourth-quarter revenue declined by just 2% year over year. GAAP earnings came in at $1.46 per share, down from $3 per share during the prior-year period, but $0.16 higher than analysts were expecting. Lower revenue and higher operating costs drove profitability down, even adjusting for the impact of currency. 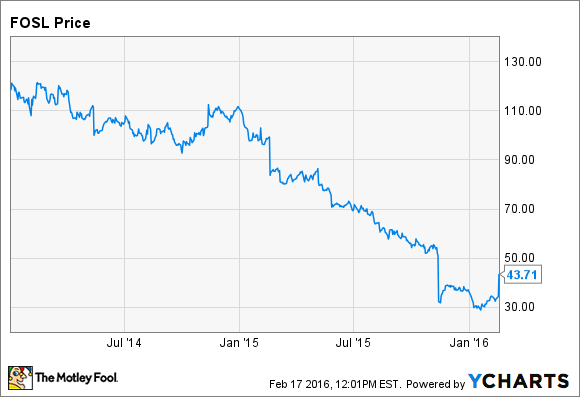 For the full year, Fossil earned $4.51 per share, down from $7.10 during 2014. Looking forward, Fossil expects sales to decrease between 7% and 10% during the first quarter, with EPS in the range of $0.05 to $0.20. For the full year, sales are expected to be in the range of a 3.5% decrease to a 1% increase, with EPS falling to a range of $2.80 to $3.60. Now what: Going into Fossil's earnings report, expectations were extremely low. The stock has been tumbling since the beginning of 2014, and prior to Wednesday's gains, it had lost nearly two-thirds of its value during the past year. Fossil had missed revenue estimates for the first three quarters of the year, with sales of watches, in particular, being hit hard. Fossil's fourth quarter wasn't good, but it was a lot better than investors had feared. Sales fell by far less than analysts expected, and while earnings took a huge hit, the company remained profitable, with an operating margin of 9% for the quarter. The company's guidance for 2016 suggests that revenue growth is possible this year, but the company's turnaround efforts are likely in the very early innings.